Directory of EU Case Law on Competition, prized since 2007 by practitioners in EU competition law for its easy-to-find extracts sorted by subject, covers all decisions of the Court of Justice and the General Court of the EU on competition law through the end of 2016. Practitioners in the field of EU competition law know well how difficult it is to find quickly specific references about specific subjects in the case law of the EU courts. This book aims at improving and accelerating the accessibility of the numerous courts’ decisions on the EU treaty rules and legislation on antitrust and mergers by presenting the case law in the form of extracts of the judgments sorted by subject. This well-known book, now in its second and hugely expanded edition, follows the same easy-to-use format as the earlier volume and covers all the case law on the substantive and procedural aspects of the EU treaty rules and legislation on antitrust and mergers. Hundreds of headings and subheadings present virtually every point from which a researcher is likely to start. Each subject heading starts with extracts having a more general meaning followed by extracts relating to specific points or situations. Extracts are accompanied by cross references where appropriate. Extracts are drawn from all EC competition case law encompassing every judgment and order in the ‘Reports of Cases before the Court of Justice and the General Court’ (‘Summary of the Judgment’) until 2017. Under about 900 headings (forty-seven chapters with numerous divisions and subdivisions), it enables practitioners to obtain in a minimum of time an overview of what the EU courts have actually stated about a specific point, including detailed references. 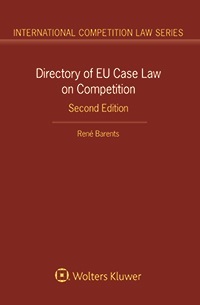 Although it is primarily of value to barristers, solicitors, in-house lawyers of companies and associations of companies, officials of national competition authorities and other active practitioners in EU competition law, this book will also be welcomed by scholars and others who need a quick overview of what the European courts have actually stated about a specific point (including detailed references) in the field.